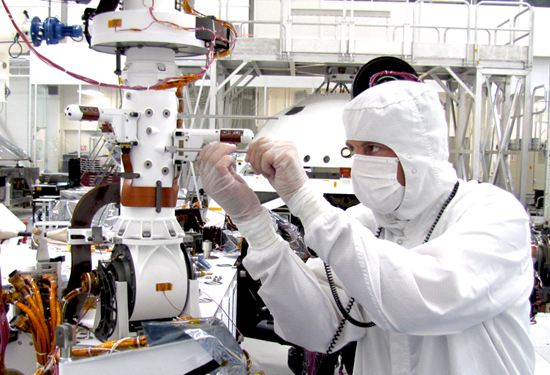 Co.Design visits the “clean room” where scientists are finalizing seven years of effort spent designing the Curiosity, which will roam the surface of Mars. For seven years, the scientists building NASA’s next-generation Mars rover have been refining every last detail aboard, in order to service one single goal: Searching for signs of life on Mars. 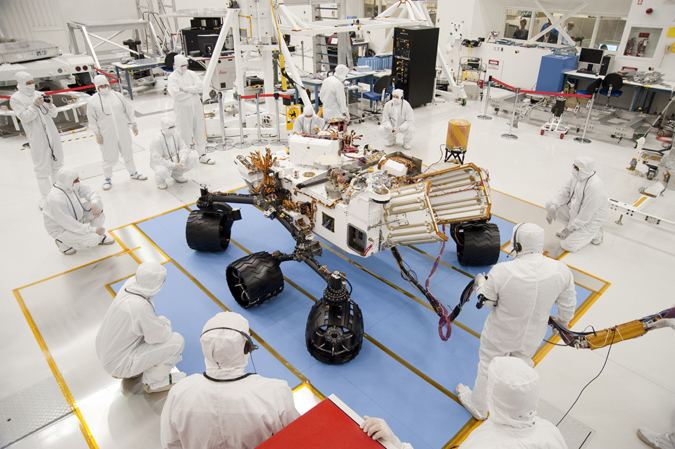 The result of that effort, the Mars Science Laboratory (MSL) Curiosity, is getting its final tweaks in a pristine room, almost totally dust and microbe-free, at NASA’s Jet Propulsion Laboratory in Pasadena, CA. It ships to the Cape Canaveral Air Force Station in Florida in June, in preparation for a late fall launch and nine-month interplanetary journey. NASA will choose the final landing site this summer. 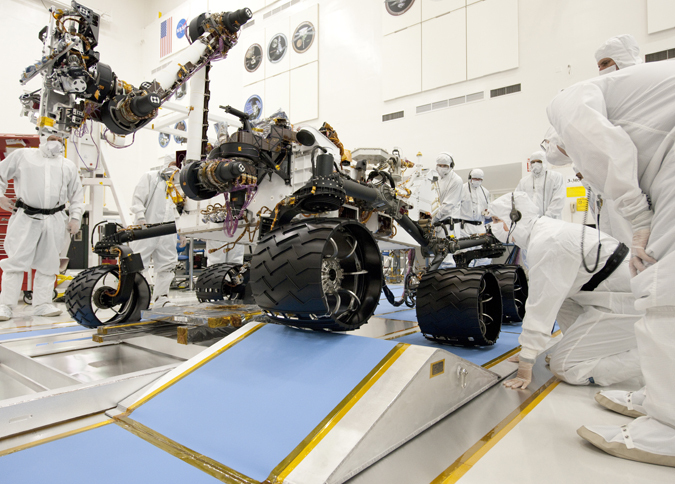 Compared to twin predecessors Spirit and Opportunity, the Mars Exploration Rovers (MER), which were dispatched in 2003 to look for traces of Martian water, Curiosity‘s larger size and more intricate functions demanded an overhaul of the landing, powering, sample-gathering, and analysis systems. Landing the rover on Mars becomes a mid-air ballet. The rover portion is a semi-automated, nuclear-powered, six-wheel-drive vehicle that can turn 360 degrees in-place, traverse 12 miles of cold, rugged terrain, and last nearly two years. 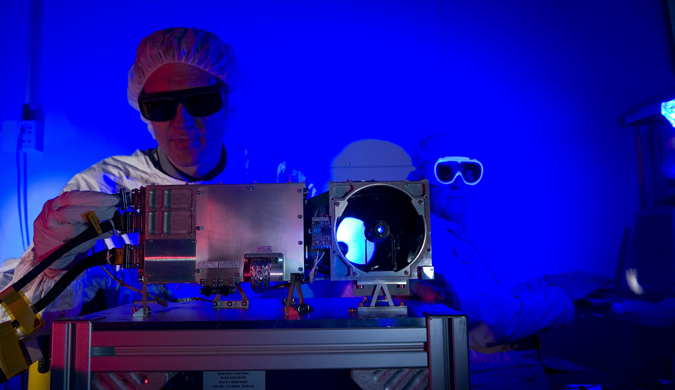 It has mounted cameras and a seven-foot extendable arm for sample gathering, an on-board lab that analyzes their chemical make-up for organic clues of former life, and a UHF transmitter to beam that information back to Earth via Mars orbiters, which relay the data to NASA’s Deep Space Network of antennas on Earth. All of which makes curiosity bigger and heavier, so the complexity involved in landing it on the Martian surface, some 36 million miles from Earth, becomes almost mind-boggling. It’s a mid-air, mechanical ballet, where every step must take place with perfect timing and grace. At 10 feet long and over 2,000 lbs., Curiosity is twice as long and five times heavier than the previous rovers, which meant figuring out a new way to land. So instead of the previous method of enveloping the rover in protective airbags, propulsive descent jets will cushion Curiosity‘s fall. The rover will journey to Mars inside an aeroshell, a protective bi-conical covering composed of a back shell on top and heat shield on bottom. A circular contraption holding eight retro rockets will then attach to Curiosity like a jet backpack that will lower it to the ground. The craft’s center of mass is away from its centerline to create greater lift and better steering for a more precise landing. Minutes before touchdown, a parachute atop the back shell will slow the craft’s descent until the heat shield is no longer needed and pops off. At that point, the descent stage detaches from the top shell, firing the retro rockets to slow its descent and lowering the rover by tether to the surface. The descent stage then detaches from the rover, flies off, and crashes elsewhere. The second major challenge was figuring out a way to extract small enough samples (particles 25 microns to 1 mm in size) for analysis–unlike the preceding rovers, which simply prepared rock surfaces for remote analysis. Unable to pulverize rock cores, the engineers designed two tools at the end of the arm: one that collects powdered rock as it drills, and another that sieves the powder, then drops the smallest in the instruments for analysis. The arm can even change a drill bit. “There were a lot of false starts and blind alleys on that process,” says Theisinger.